Inspired by a dream, I have been gathering photographs from my past and bottling them. The torn edges of the photographs reference the fragmentary nature of memory. Many of the pieces are designed as sets, so that the bottles when grouped together take on a cubistic quality, emulating how the eye moves through a scene, never quite recording the entire picture. Others are designed as single bottles filled with layers of texts and maps that connect the photograph to a specific moment in time and place. In all the pieces, the photographs hover in mineral oil like specimens, once fully alive, now waiting to be analyzed. I have been particularly drawn to imagery of the natural world because it is nature that science has worked so hard to seal and study, while paradoxically it is nature that holds mysteries larger than can ever possibly be contained. Please click on the thumbnails to see larger images and titles. Please scroll down to the bottom to learn more about the technical process. 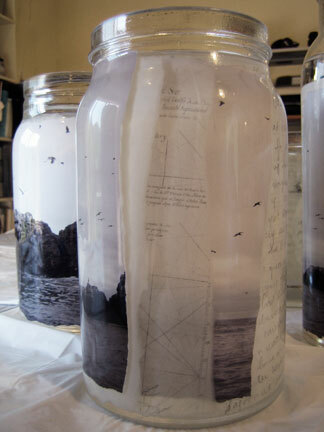 All pieces in this series are mixed media sculptures made of bottles, photographs and sometimes other texts. The liquid in the bottles is mineral oil – a very stable, neutral oil. Because, at a molecular level, paper and oil are not soluble, the mineral oil does not degrade the photographs. The bottles are sealed with silicone. 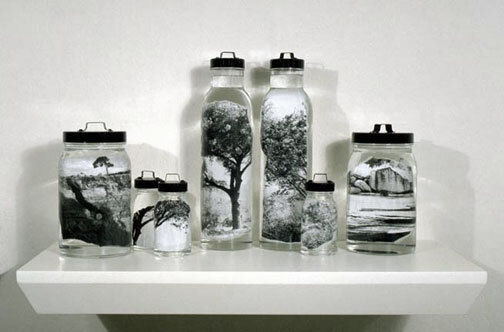 The sets of multiple bottles feature gelatin silver prints, created in the darkroom. They are intended to be viewed from the front. The single bottle sculptures use photographs printed on an Epson 2200 with archival inks. These individual bottles also contain maps and texts that reference the place and story of the photograph depicted, and they are meant to be seen in the round.